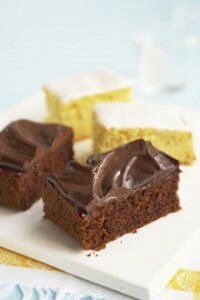 This is definitely the quickest and easiest way to cook a quantity of cakes for a party. This quantity fits the small AGA roasting tin, double the quantities to fit the large roasting tin. It freezes well iced or un-iced. 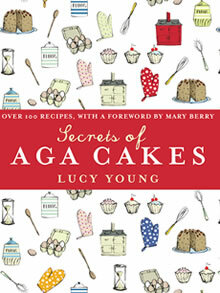 You will need a small Aga roasting tin (or traybake tin measuring 30 x 23 cm/12 x 9 in), lined with foil and greased. Measure the cocoa powder into a bowl and mix with the boiling water to give a smooth paste. Add the remaining ingredients to the bowl and beat well until smooth. Pour into the prepared tin. Slide the tin onto the grid shelf in the roasting oven with the cold shelf on the second set of runners. Bake for 25–30 minutes, until shrinking away from the sides of the tin and springy to the touch. Turn once during cooking. Slide the tin onto the lowest set of runners in the baking oven and bake for about 20 minutes, until shrinking away from the sides of the tin and springy to the touch. If the cake is getting too brown, slide the cold sheet onto the second set of runners. For the icing, measure the chocolate and crème fraîche into a bowl and leave on the back of the AGA. Stir occasionally until all the chocolate has melted. (For a conventional oven, measure the chocolate and crème fraîche into a bowl and heat gently over a pan of simmering water, stirring until melted.) Set aside to thicken a little. When the cake has cooled, spread with warm raspberry jam and spread over the icing. • Warming the jam makes it easier to spread over the cake. The easiest way to warm the jam to save heating in a pan is to sit the jar on the back of the Aga or in the simmering oven for about 10 minutes.